Consumers are continually hunting for free WiFi whenever they’re shopping or dining out. Many restaurants and retail businesses offer free WiFi to accommodate their guests and it can be used as an effective advertising tool. But there’s a better way to give your customers free WiFi. It’s called social WiFi and here’s how it works. Customers can select your free WiFi from their smartphone settings. To access the free wifi, the guest logs in with their email address or uses one of their social media logins such as Facebook, Twitter, Google Plus, Instagram or LinkedIn. That’s why it’s called social WiFi. 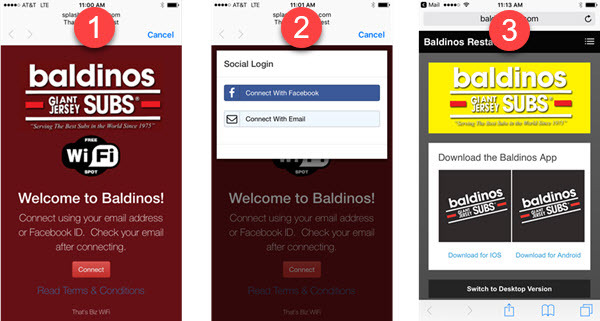 The screenshot below shows the simple 1-2-3 process your guests use to access your free wifi. So what are the benefits of social wifi for your restaurant or business? When guests sign in with their Facebook login (Screen 2 above), the system records their name, email address, and demographics. You can even ask for their birthday. Your wifi system can also trigger an automated email after the guest signs in. Typically, restaurants send bounce back coupons for a future visit or ask the customer to complete a brief survey. Subsequent guest visits only require connecting to your free WiFi. No login is required. The social WiFi system records the date and time of each guest connection. Your connection data reports show you the busy times and days in your business and the overall demographics of your customers. Export captured guest names and email addresses to your email marketing system. What is required to use social wifi for your business? Nearly all businesses hook up to the internet with a cable modem. Your POS system and/or your credit card processing equipment is currently attached to the cable modem. Simply plugging in a pre-configured router into your cable modem provides your business with social WiFi. Your pre-configured router separates your guest traffic from your POS and credit card processing system. Many times businesses are more secure after installing a social WiFi system because their old free WiFi setup was on the same network as their POS/credit card processing. What about customer abuse of social WiFi? The last thing you want is offering guests free WiFi only to have one guest taking up all of the bandwidth. Your WiFi system allows setting reasonable upload and download speeds so that all guests can access the free WiFi. You can also limit the amount of time people can spend on WiFi without having to reconnect. What if you have a large location, outdoor patio or lots of walls? Selecting the right equipment for your WiFi system makes addressing large venues or locations with walls a much simpler process. Locations needing additional WiFi coverage only require additional routers that plug into a standard electrical outlet. A standard router will cover about 2,500 square feet. What about preventing employees from accessing the free wifi? Certainly, make your WiFi policy clear to employees when you implement your social WiFi system. If employees connect to the free WiFi and they are not supposed to, you can block them from future access. Social wifi has proven to be the easiest and most effective method for businesses to grow their email lists. 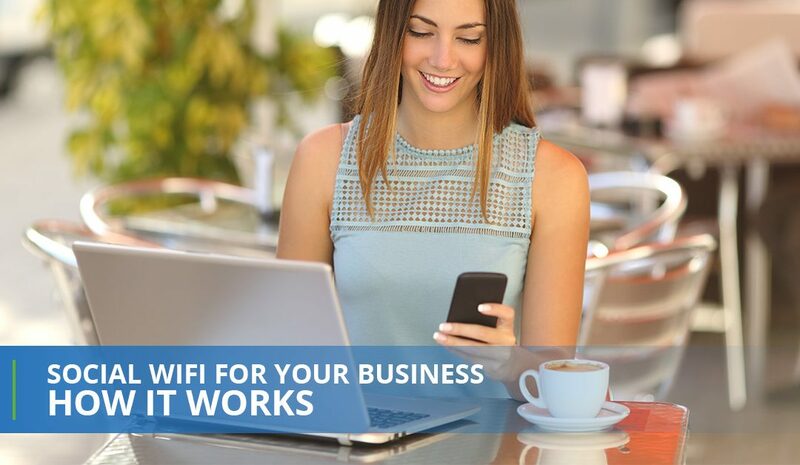 Don’t just give away free WiFi – give your customers social WiFi and give your business marketing a boost. If you want more information about an affordable guest wifi solution, click on Guest Wifi for Restaurants. Pricing is as low as $49/month. What about Yelp’s new WiFi service for my clients. I am on the fence about recommending it to them. Yelp’s guest WiFi service is the result of an acquisition of another product. That’s not a bad thing. If you check their service it has a fairly high per monthly fee (at least it did in January 2018). Most businesses already have in place other marketing they have been doing for a while. We see guest WiFi primarily as a feeder of email addresses or mobile numbers for texting to their other marketing channels. If that is the case you can save your clients a lot of money and give them the benefits of guest WiFi.